Lululemon Athletica Inc. reported a drop in profit for the fiscal first quarter amid a tax charge tied to a share-repurchase plan and lowered its outlook for the year. Comparable-store sales for the first quarter decreased 4 percent on a constant dollar basis. The retailer also issued a second-quarter forecast that fell short of Wall Street's expectations. The company also announced that its board of directors has approved a stock repurchase program to buy back up to $450 million of its common shares in the open market at prevailing market prices. Net revenue for the quarter increased 11 percent to $384.6 million from $345.8 million in the first quarter of fiscal 2013. Total comparable sales on a combined basis increased 1 percent for the first quarter on a constant dollar basis. Comparable corporate-store sales for the first quarter decreased by 4 percent on a constant dollar basis and direct to consumer revenue increased 25 percent on a constant dollar basis. Direct to consumer revenue increased to $66.0 million, or 17.2 percent of total company revenues, in the first quarter of fiscal 2014, an increase from 15.6 percent of total company revenues in the first quarter of fiscal 2013. Gross profit for the quarter increased 15 percent to $195.7 million, and as a percentage of net revenue gross profit increased to 50.9 percent for the quarter from 49.4 percent in the first quarter of fiscal 2013. Gross profit for the first quarter of fiscal 2013 included a provision of $17.5 million related to the pull-back of black Luon pants. Income from operations for the quarter increased 6 percent to $69.8 million, and as a percentage of net revenue was 18.2 percent compared to 19.1 percent of net revenue in the first quarter of fiscal 2013. Tax expense for the quarter was $52.5 million, which included a one-time adjustment of $30.9 million for the planned repatriation of foreign earnings that will be used to fund the share buyback program. The normalized tax rate before the $30.9 million non-recurring adjustment would have been 30.1 percent, compared to 29.8 percent a year ago. The tax rate for the first quarter of fiscal 2014, including the one-time adjustment, was 73.4 percent. 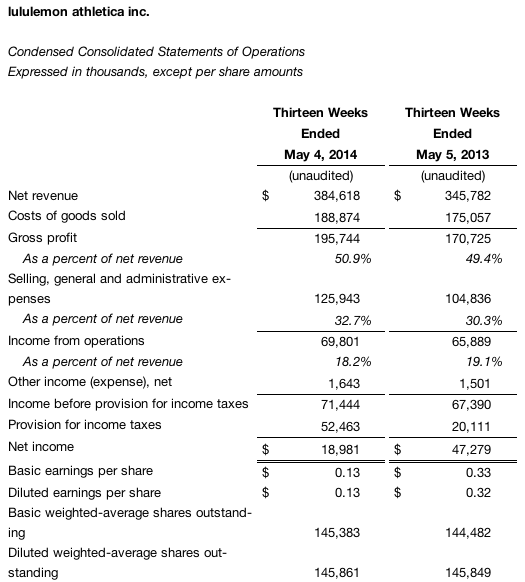 Excluding the one-time adjustment, diluted earnings per share were 34 cents in the first quarter of fiscal 2014. Including the non-recurring adjustment, diluted earnings per share for the quarter were 13 cents, which included a 21 cents per share impact from the planned repatriation of foreign earnings. Earnings were slightly above guidance but same-store sales fell short. When it reported fourth-quarter earnings on Mar. 27, it said it expected first-quarter sales to ranged between $377 million to $382 million based on flat total combined comparable sales on a constant dollar basis. Diluted earnings per share were expected to be in the range of 31 cents to 33 cents for the quarter. The company ended the first quarter of fiscal 2014 with $752.0 million in cash and cash equivalents compared to $588.4 million at the end of the first quarter of fiscal 2013. Inventory at the end of the first quarter of fiscal 2014 totaled $177.4 million compared to $143.7 million at the end of the first quarter of fiscal 2013. The company ended the quarter with 263 stores. For the second quarter of fiscal 2014, Lululemon expects net revenue to be in the range of $375 million to $380 million based on a total combined comparable sales decrease in the low to mid single digits on a constant-dollar basis. Diluted earnings per share are expected to be in the range of 28 to 30 cents for the quarter. This guidance assumes 146.0 million diluted weighted-average shares outstanding and a 30.2 percent tax rate. The guidance does not reflect the potential repurchase of shares. Wall Street's consensus estimate had been 36 cents a share on average revenues of $387.2 million. For the full fiscal 2014, we now expect net revenue to be in the range of $1.770 billion to $1.800 billion based on a total combined comparable sales increase in the low single digits on a constant-dollar basis. Diluted earnings per share are expected to be in the range of $1.50 to $1.55 for the full year, or $1.71 to $1.76 normalized for the one-time tax adjustment related to the planned repatriation. This guidance assumes 146.3 million diluted weighted-average shares outstanding and a 38.6 percent tax rate, which includes the tax adjustment for the planned repatriation, or 30.2 percent before the tax adjustment. The guidance does not reflect the potential repurchase of shares. $1.80 to $1.90 for the full year.